Portillo is one of Chile’s most famous ski resorts, and is set into a picturesque piece of the Andes, above a turquoise lake, and under some of the most sought-after peaks in South America. It is about a two-hour drive from Santiago, towards the Argentine border, and though it would be a good day trip, most people who ski here come for a week. 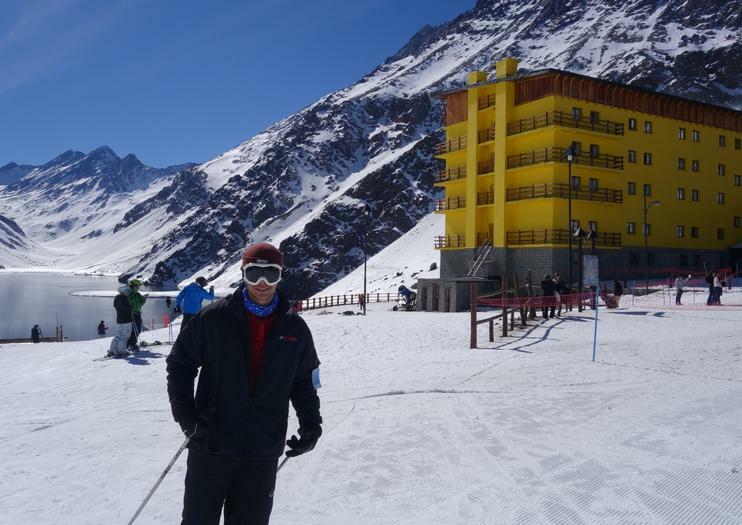 The conditions here are generally some of the best in Chile, and the resort has 80% sunny days and an average seasonal snowfall of about 25 feet. The terrain maxes out at about 11,000 feet and has a vertical drop of 2500 feet. International teams have been training here during the northern summer for decades, but the resort is mostly filled with Chilean families, especially during the July summer holidays when children have a week off from school. The high season runs until late September, but there can easily be good ski conditions through October, depending on the year. Even if you don’t ski, a visit to the resort is beautiful at any time of year, and there is a gourmet restaurant on site, with a view over the Laguna del Inca, as well as a few walking trails you might want to try. Or head a little closer to Argentina an check out Aconcagua, the tallest mountain in South America at 22,841 feet. Consider Portillo as a daytrip for the fantastic Andean scenery on the way up and down, and tasty gourmet lunch on site, but do plan to come for the full week if you really want to see the best of Portillo. Get a true alpine high during this 8-hour road trip to the scenic ski area of Portillo from Santiago with a small group. Travel with no more than 8 guests aboard an air-conditioned van as you travel along Los Libertadores Highway through the Aconcagua Valley, eventually reaching this picturesque snow resort with its views of the ‘Laguna del Inca’ (Inca Lagoon). Once you’ve got your powder fix, leave Portillo Ski Center the easy way with a pre-booked transfer to Santiago. Your driver will pick you up from the ski center and drive you directly to your Santiago hotel - all you have to do is sit back and enjoy the scenery.